Uh. If you have to ask, maybe it’s best to throw it out. Better safe than sick, right? When it comes to food, those kinds of decisions aren’t difficult. But did you know that car seats have expiration dates, too? 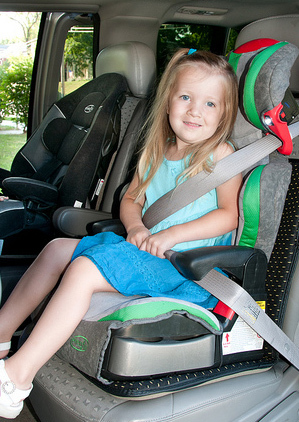 This week, Sept. 16-22 is National Child Passenger Safety Week. ﻿﻿"Many parents don't realize that using an expired car seat can compromise their child's safety," Spainhower said. "Unless you have specific directions from the manufacturer, the car seat label or the manual that state otherwise, you should stop using a car seat after six years. Expired car seats should be destroyed so no one uses the seat thinking it's still safe." Car seats have a rough life. The materials in them expand when temperatures inside vehicles soar well above 120 degrees in the sun and way down below freezing in the winter. They take a pounding from little bouncing bottoms – and excited, jumping feet – and are schlepped none too gently from vehicle to vehicle. Hairline cracks can form - too tiny for most to see - yet they can compromise the seat and cause it to perform poorly during a crash. Good thing there are helpful Missourians who are certified to check car seats. They want you to know they’re happy to take a look at your car seat, get it installed correctly – about 80 percent of seats need at least some kind of adjustment – and answer your questions about the best seating for infants, toddlers and junior backseat drivers. Visit the National Highway Traffic Safety Administration’s Inspection Station locator to find certified experts near you - www.nhtsa.gov/cps/cpsfitting/index.cfm . Almost all perform the service free of charge. They will not, however, sniff the contents of that bottle you found under the passenger seat. This blog was written by Travis Ellis of MoDOT's Northwest District office. Everything is more expensive these days, and the need to prolong our items is becoming even more important. Many of you take the time to polish or "seal" your favorite, or most expensive pairs of shoes before the onset of winter. You do this to keep what is inside dry, and to make the shoes last longer, just like the Missouri Department of Transportation does with its bridges. "We seal our bridges for the same reason folks seal their shoes," says District Maintenance and Traffic Engineer Marty Liles. "Whether you are weather-proofing a pair of shoes, or a bridge, it protects them from the elements and makes them last longer." 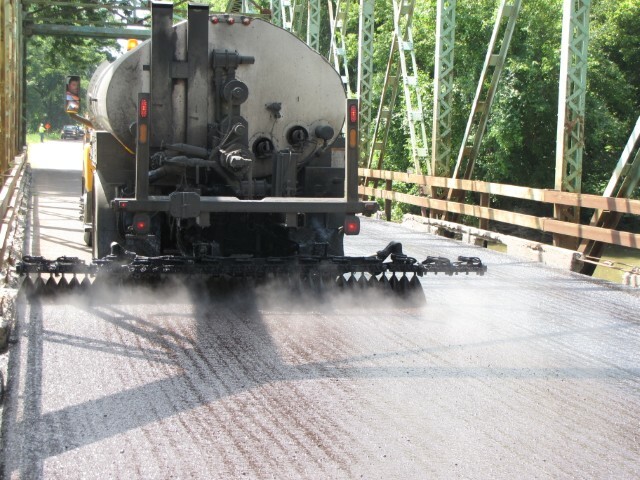 In the coming weeks, motorists can expect to see discolored bridge decks, extra work zones and crews around many of Missouri's bridges. As the sealant is applied, it fills cracks, even those too small for most people to see. That keeps water from seeping into the pavement. When water does manage to get through pavement, it expands when it freezes, causing the crack to grow larger, sometimes creating potholes. Bridges are selected for sealing, or re-sealing, based on a number of factors. All new bridges are sealed prior to their first winter. After a bridge has been sealed the first time, existing bridges are scheduled for re-sealing on a rotating basis. "We are taxpayers too, and we want to preserve and prolong our roads and bridges in the most cost-effective means as possible," says District Engineer Don Wichern. "Sealing a bridge deck prolongs the life of the bridge, thereby pushing back the day when it will have to be replaced. It's just another way we are trying to maintain our system for as long as possible with the funds available." If it weren't for Post-It notes, I wonder if I'd get anything done. I often write reminders to myself and then place the notes in logical spots...at least what I consider logical. "Hair," says the note, stuck to my steering wheel, reminding me to run by the salon after work for a trim. "Chicken," says the note on the door leading to my garage. It was supposed to remind me to get food out of the freezer for dinner. Whoops. I missed that one. Good thing MoDOT has a more permanent reminder at the end of many of its parking lots. Right before I pull out, I see a reminder to buckle up. Schools, businesses and other organizations can borrow the stencils to encourage visitors to buckle up and Arrive Alive. The reusable stencils are available on a first-come, first-served basis from MoDOT's seven regional offices. Designs can be painted on concrete or asphalt surfaces in parking lots and driveways of schools and businesses. Those requesting the stencils must provide their own paint and manpower. A reminder might just help improve traffic safety. As of September 9. traffic fatalities in Missouri are up 9 percent for the year, and 63 percent of those killed in traffic crashes this year were not wearing a seat belt. 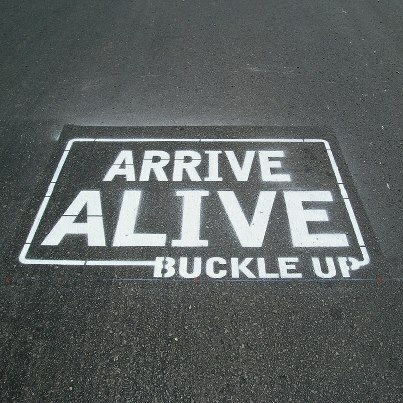 For more information about the stencils or other highway safety resources available to help educate students about safe driving practices, call 1-888-275-6636 or log onto http://www.savemolives.com/. Many times in this blog, we tell you about MoDOT employees and the work they do. We hope you enjoy learning about what happens behind the scenes. Recently, we received a note from a resident of Southeast Missouri. Instead of telling you what MoDOT employees do, it explains who they are. I would like to thank the workers in Jackson, MO next to the park on Hwy 61. We were passing in a funeral prosession for a family member and the men working there stopped digging and removed their hard hats as we passed by. Having moved here from Dallas, let me tell you this kind of compassion and respect is not often given. Several of my family members noticed this as well. I commend these men for the actions, regardless how small, it was greatly appreciated by my family and I.
I am proud to work with thoughtful, caring people such as these. School is back in session and a hint of fall is in the air. With that comes those first few exciting weeks of school and, of course, big weekend plans. I grew up in a small rural town. As a teen we had our local buyer, you know, that guy in his mid twenties that still cruised by the high school during class time, ever so slowly to make sure that everyone knew he didn’t have to go to school. I don’t think he had a job either, but anyway, he was the town buyer. Slip him enough for a six pack for himself and he’d buy you whatever you want. Weekends were then spent in a field or on a dirt road drinking ourselves into a stupor on Boone’s Farm Strawberry Hill, or whatever else we could afford. We never gave a thought as to how we would get home. Usually the one that drank the least would get behind the wheel. We would take the back roads, coast the car down the hill to the house and park it, stagger indoors and pass out. We just didn’t think about a DWI or minor in possession, let alone a car crash, serious injuries or death. It’s much different today. The word is out and everyone knows that drinking and driving is a deadly combination. So let’s face it, you know the risk and you know the consequences. Missouri has a Zero Tolerance Law. If you are under age 21, your license will be suspended if you’re caught driving with even a trace of alcohol in your system. If you cause a fatal crash while intoxicated, you can be charged with involuntary manslaughter, a felony resulting in up to seven years of jail time, a $5,000 fine or both. 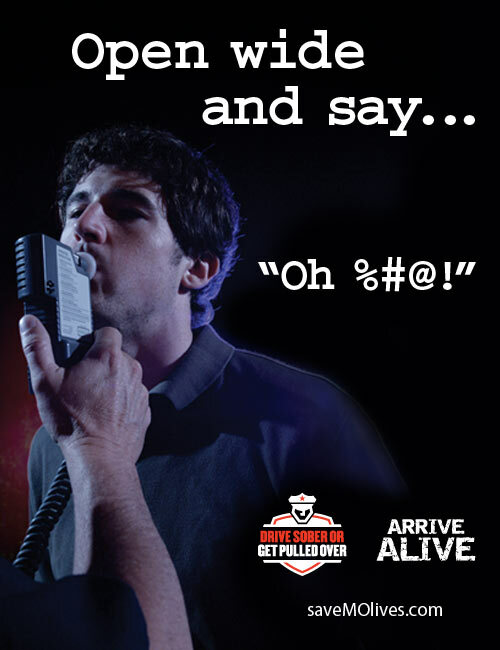 In 2011, 218 people died and 867 were seriously injured in crashes involving an impaired driver. Missouri takes this seriously. What part of Drive Sober or Get Pulled Over don’t you understand? ARRIVE ALIVE.